We know that human activity does contribute to climate change on Earth. However, it’s difficult to answer the question of how much we really impact the changes we witness. One thing is certain: Animal agriculture definitely has a role to play in it. According to studies over the past few years, the growing public and governmental concern is that greenhouse gas (GHG) emissions are the greatest contributor to the global warming phenomenon. If we want to preserve our planet, we need stronger regulations to reduce future effects of increasing global temperatures. Carbon dioxide, nitrous oxide, and methane are the three most destructive GHG emissions in the atmosphere, comprising almost 98 percent of the total. At the same time, they are all significant byproducts of human activity, such as animal agriculture. How Does Animal Agriculture Contribute to Climate Change? Animal agriculture is responsible for about 9% of human-caused carbon dioxide emissions globally. Moreover, animal agriculture is a leading source of other greenhouse gases. Ruminant animals, such as cattle, produce methane, which is roughly 20 times more potent than carbon dioxide. The livestock sector generates 37 percent of human-caused methane emissions. Also, it is responsible for 65 percent of human nitrous oxide emissions globally. However, in spite of various studies claiming the contrary, animal agriculture and meat consumption are only small contributors to U.S. GHG production. According to U.S. Environmental Protection Agency (EPA), just 2.8 percent of U.S. GHG emissions came from animal agriculture in 2007. This occurred through manure management and enteric fermentation (a process that describes the digestion of feed by ruminant animals). However, the impact of animal agriculture on GHG emissions has remained almost constant since 1990. Why is this impressive? Because the U.S. meat production has increased with almost 50 percent, milk production 16 percent, and egg production almost 33 percent. It proves that the livestock sector has improved feed efficiencies, developed better manure management strategies and efficient use of cropland. Today, the average American farmer is able to feed about 144 people worldwide. Nearly 85 percent of U.S. grazing lands cannot be used for crop production. However, grazing animals on this land doubles the area that can be used to grow food. A balanced diet should contain meat and poultry. These food items are not only nutrient dense, but also considered complete proteins – meaning that they comprise all of the nine essential amino acids humans need. According to the current U.S. Department of Agriculture, 63 grams of protein is the daily recommendation for adult men and 50 grams a day for adult women. In the United States, the livestock industry raises approximately 10 billion land animals annually for dairy, meat, and eggs. Scientists are still evaluating their impact on climate change, but they generally agree factory farming is a significant contributor to GHG emissions. USDA claims that raising animals for food (including land used to grow feed crops and grazing land) now covers a surprising 30 percent of the Earth’s land mass. Factory farms often collect the tons of animal urine and feces in cesspools; when they get full, many factory farms will try to avoid water pollution by spraying liquid manure into the air. Needless to say, the result of this action is toxic mists that get carried away by the wind. Studies have shown that animal farms generate air pollutants that often cause lung inflammation, respiratory illness, and increase vulnerability to asthma and other respiratory diseases. At the same time, emissions of ammonia and reactive organics from animal farming can contribute to smog and air pollution. On a global level, scientists estimate that deforestation for feed crops and animal grazing generates 2.4 billion tons of CO2 annually. Moreover, burning fossil fuels to produce fertilizers for animal feed crops also emits 41 million tons of CO2 per year. The statistics are not encouraging. For example, an acre of rain forest is felled to create room for cattle farming every six seconds; that’s approximately 14,400 acres daily. Also, every minute, about seven football fields of land are bulldozed and leveled worldwide for farmed animals. According to a 2008 study, a meat-eater’s diet causes more than seven times as much GHG emissions as a vegan’s diet. Therefore, following a vegan diet will release roughly 1.5 fewer tons of carbon dioxide into the atmosphere annually. Various organizations and movements exaggerate some of the facts above to benefit their agendas. For example, people often suggest that going vegan is the most important thing we can to stop the climate change. 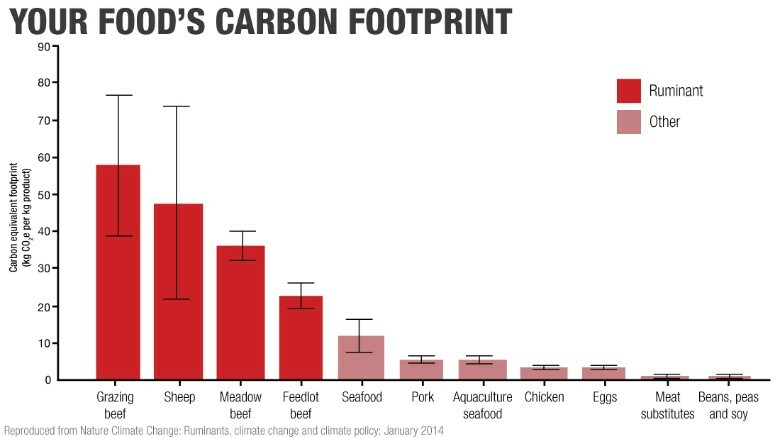 While reducing meat consumption (particularly beef) does reduce greenhouse gas emissions, there are other human activities that are more harmful. An oft-used comparison that contributes to our flawed perception is that animal agriculture generates more human-caused greenhouse gas emissions (14-18 percent) than transportation (13.5 percent) globally. This statistic is true. However, it is important to keep in mind that transportation is just one of the sources of fossil fuel combustion. Heat and electricity generation, for example, accounts for almost 25 percent of global GHG emissions alone. Also, in the U.S., where people use the “veganism will solve the problem” argument the most, fossil fuels emit more than 10 times more GHG emissions than animal agriculture. However, this is not meant to minimize the impact animal agriculture has on global warming. While we acknowledge its adverse environmental impacts, it’s also important to not minimize the much larger effect of fossil fuels. There might be a silver lining in the near future. Thankfully, methane only remains in the atmosphere for 12 years. For this reason, we could take the opportunity of mitigating global warming by regulating the livestock industry. Because methane has such a short half-life, drastic emission reductions could help us undo significant amounts of damage. All in all, we need more drastic policies that take a firm stance on minimizing the effect of animal agriculture.